Yesterday I was honored to receive a beautifully written testimonial from one of my long-time marketing coaching clients, Olde New England Granite. Though I have always encouraged my marketing clients to gather testimonials from their customers, and I do have a long list of client testimonials, I have never had a client who has sent me such a long and powerful recommendation to why hiring me as your Marketing Coach will help your business as Wesley Reed, President/CEO of The Reed Corporation/Olde New England Granite. My sincere thanks to Wes for hiring me four years ago and for his kind words about my work as a marketing coach! 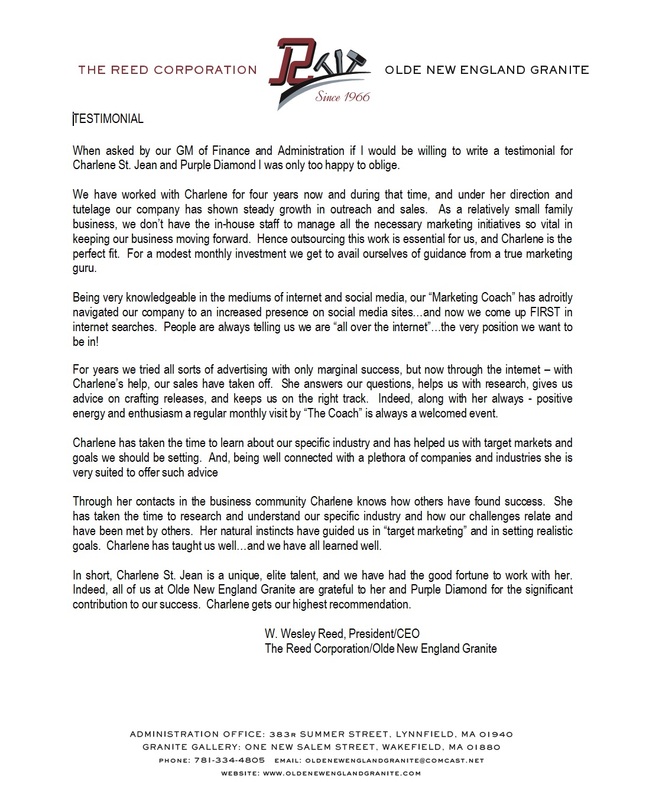 “When asked by our GM of Finance and Administration if I would be willing to write a testimonial for Charlene St. Jean and Purple Diamond I was only too happy to oblige. We have worked with Charlene for four years now and during that time, and under her direction and tutelage our company has shown steady growth in outreach and sales. As a relatively small family business, we don’t have the in-house staff to manage all the necessary marketing initiatives so vital in keeping our business moving forward. Hence outsourcing this work is essential for us, and Charlene is the perfect fit. For a modest monthly investment we get to avail ourselves of guidance from a true marketing guru. Being very knowledgeable in the mediums of internet and social media, our “Marketing Coach” has adroitly navigated our company to an increased presence on social media sites…and now we come up FIRST in internet searches. People are always telling us we are “all over the internet”…the very position we want to be in! For years we tried all sorts of advertising with only marginal success, but now through the internet – with Charlene’s help, our sales have taken off. She answers our questions, helps us with research, gives us advice on crafting releases, and keeps us on the right track. Indeed, along with her always – positive energy and enthusiasm a regular monthly visit by “The Coach” is always a welcomed event. Through her contacts in the business community Charlene knows how others have found success. She has taken the time to research and understand our specific industry and how our challenges relate and have been met by others. Her natural instincts have guided us in “target marketing” and in setting realistic goals. Charlene has taught us well…and we have all learned welIn short, Charlene St. Jean is a unique, elite talent, and we have had the good fortune to work with her. Indeed, all of us at Olde New England Granite are grateful to her and Purple Diamond for the significant contribution to our success. Charlene gets our highest recommendation.” – Wesley Reed, President/CEO of The Reed Corporation/Olde New England Granite. Are you looking for better results for your business? Contact Purple Diamond and ask about the Marketing Coaching Services. Rates start at $250 per month. Call 978-927-0626 or email Charlene@purplediamondmarketing.com to learn more.